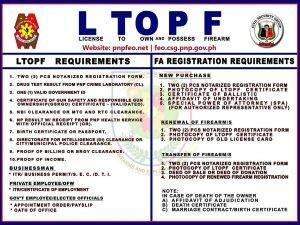 What is the PNP ITP-PGS 2030? What does the acronym P.A.T.R.O.L. stands for? What happened to the "Integrated Transformation Plan (ITP)"? What are the changes introduced to improve the ITP using the PGS framework? Why do we use the PGS as the framework for the PNP PATROL PLAN 2030? What are the stages of the PGS? Where is the PNP in its governance journey? Who formulated the PATROL PLAN 2030? What is the role of the PGS Technical Working Group in the implementation of the PATROL PLAN? Is the PATROL PLAN 2030 the ultimate solution to all the problems of the PNP? What is the new vision of the PNP? What is the rationale behind the timeline of 2030 of the PATROL PLAN? What is the mission of the PNP? What are the philosophy and core values of the PNP? What are the four (4) strategic perspectives of the PNP Strategy Map? What is the rationale behind choosing the four (4) strategic perspectives of the PNP Strategy Map? What is the role of the stakeholders in the PATROL PLAN 2030? What are the benefits to the PNP organization using a scorecard system? What is the rationale of choosing the 11 strategic initiatives? 1.What is the PNP ITP-PGS 2030? 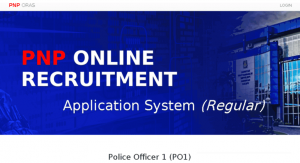 The PNP integrated Transformation Program – Performance Governance System (PNP ITP-PGS) 2030 is the governance Roadmap of the PNP which is an upgraded version of the ITP. The PGS is the Philippine adaptation of the Balanced Scorecard, a management tool used in tracking the organization's progress in attaining its vision by 2030. The PNP ITP-PGS Roadmap, using the PNP-ITP as its core foundation, was formulated, focusing its direction toward the achievement of the PNP's vision by year 2030. The PNP ITP-PGS Roadmap is now called as the "PNP PATROL Plan 2030". 2. What does the acronym P.A.T.R.O.L. stands for? PATROL stands for "Peace and Order Agenda for Transformation and upholding of the Rule-Of- Law"
3. What happened to the "Integrated Transformation Plan (ITP)"? The PNP ITP has evolved into an updated version by the introduction of the PGS as a management tool which provides a tracking mechanism to determine how far is the PNP from its vision and is it on the right track. The transition from ITP to the ITP-PGS can be best illustrated by a software upgrade, say for example, from Windows XP to Windows 7. While the original platform still works, the new system includes updates that address current needs, makes programs run faster and ultimately help improve operating efficiency. 4. What are the changes introduced to improve the ITP using the PGS framework? The introduction of the scorecard encapsulates all the changes brought about by PGS framework to the ITP. First, the vision is now set with timeline of 2030 although the PNP is may attain it at an earlier time; the charter statement was formulated which is a one-page Roadmap for the PNP. The PNP strategies are mapped out in the strategy map according to the four (4) perspectives that serves as the pillars of our vision. Feedback mechanism is put in place. Individual and collective performance can be easily tracked. Targets were set to serve as the check and balance if we are on the right track and how far are we from our vision 2030. The National Advisory Group for Police Transformation and Development (NAGPTD) was formally organized with 15 members who serve as institutional partners and advisers. The Program Management Office (PMO) was deactivated on December 14, 2011. The Center for Police Strategy Management was activated as required by the PGS to ensure the sustainability of PATROL PLAN 2030. It is responsible for integrating, coordinating and monitoring activities across functions and other offices to ensure alignment of strategies, resources and operations. 5. Why do we use the PGS as the framework for the PNP PATROL PLAN 2030? The PGS Framework is a holistic approach. It provides balance on all the perspectives that are closely interrelated and inter-connected that address the issues and concerns of the PNP as it moves toward the realization of its vision. As a management tool, it provides transparent reporting of measures, targets and initiatives and milestones which are all made available to all its personnel and external stakeholders. Performance of the individual PNP personnel as well as the performance of the PNP as an organization can be easily tracked by the use of scorecard. It serves as a useful aid in planning at all levels. It provides for the clear direction individually and collectively towards PNP vision 2030. 6. What are the stages of the PGS? 7. Where is the PNP in its governance journey? The PNP was conferred the 'initiated' status on September 24, 2009 and was awarded by ISA and PALLADIUM the 'compliance' stage on October 14, 2011. It is now moving towards 'proficiency' stage which is tentatively scheduled for validation by the ISA and PALLADIUM on September 2012. 8. Who formulated the PATROL PLAN 2030? The PATROL PLAN 2030 is the result of tedious analysis and review on previous PNP plans and programs, issues and concerns, challenges and inputs both from internal and external stakeholders which served as the basis of the TWG in formulating its Transformation Roadmap 2030. 9. What is the role of the PGS Technical Working Group in the implementation of the PATROL PLAN? 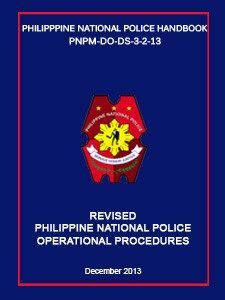 The PGS TWG which is composed of all Executive Officers of the Directorates, selected Senior and middle level officers and NUPs are in-charged in the cascading of CPNP's Scorecard in the Police Regional Offices (PROs); assists PROs in the development of their Regional Scorecards and the Operational Dashboards of Provincial Directors. 10. Is the PATROL PLAN 2030 the ultimate solution to all the problems of the PNP? Yes, the contents of the PATROL PLAN are basically the entire range of policing. It laid down the strategies to keep the PNP responsive at all times to the needs of the community/society. While it is laid down as a plan until the vision year 2030, annual review or as the need arises will not in any manner deter the inclusion or amendments to develop better strategies. It a dynamic and flexible document that allows necessary amendments as the need arises in order to cope up with the challenges brought about by different factors affecting the law enforcement/policing industry. 11. What is the new vision of the PNP? The new vision of the PNP states that "Imploring the aid of the Almighty, by 2030, we shall be a highly capable, effective and credible police service, working in partnership with a responsive community towards the attainment of a safer place to live, work and do business." 12. What is the rationale behind the timeline of 2030 of the PATROL PLAN? We must aspire now for realistic greater heights and dare for more sustainable progress. We have been underperforming due to restraints we put on ourselves & our organization. To become A TRULY TRANSFORMED PNP, we must strive for more and do better. We must strive to become the best we could be. 13. What is the mission of the PNP? The mission of the PNP as provided for by Republic Act No. 6975, as amended by RA 8551 and further amended by RA 9708 is, "To enforce the law, prevent and control crimes, maintain peace and order, and ensure public safety and internal security with the active support of the community." 14. What are the philosophy and core values of the PNP? The PNP's PHILOSOPHY is framed by "service, honor and justice", and the PNP CORE VALUES are: "makaDiyos, makabayan, makatao and makakalikasan" (pro-God, pro-country, pro-people and pro-environment). The philosophy and core values are the institutional bedrock of the PNP that provide a solid anchor which can keep it safely and soundly grounded as it goes through the vicissitudes of pursuing its mission in gearing toward its vision by 2030. 15. What are the four (4) strategic perspectives of the PNP Strategy Map? The four (4) Perspectives are: Resource Management; Learning and Growth; Process Excellence; and Community. The first perspective is "resource management." For the PNP to eventually realize its vision, the resources provided in pursuit of its mission should be "adequate". Moreover, those resources provided should be used "optimally." To help achieve maximum utilization of resources, the PNP must observe high standards of "transparency and accountability" in all its "financial and logistical transactions." The second perspective is "learning and growth." This is crucial for the PNP because it cannot keep doing the same things as in the past if it is to realize its vision by 2030. The PNP realized that 'status quo' and 'doing business as usual' is not an option anymore. It has to look forward, towards a future, in which it does things much better and more efficient through more capable people and better processes than in the past. Thus, it has to invest in people and processes so it can win "stakeholders' support" and undertake proper, efficient and effective "management of its resources." Recognizing how crucial "learning and growth" to the police organization, the PNP has decided to put two (2) strategic priorities – closely related and tightly inter-connected. The set of strategic priorities starts with developing competent, motivated and values-oriented police personnel. This when attained will result to the development of a responsive police organization that is capable and ready to do its mandated tasks. Without any doubt, all these strategic priorities within the second perspective of "learning and growth" would depend upon the adequacy of resources provided by the PNP and upon the commitment of the PNP to its philosophy framed by "service, honor and justice" as well as to the four (4) core values it has chiselled into its governance charter. Resources and commitment need to go together for them to produce results. "Learning and growth" perspectives focuses on the people but it must be complemented by strategies under the third perspectives, "process excellence". 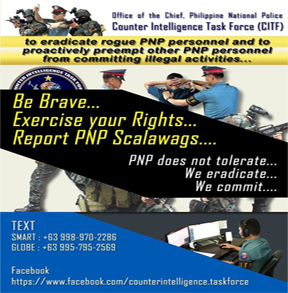 This refers to the different processes and practices the PNP uses in carrying out its mission. The four (4) processes of "intelligence", "investigation", "operations" and "community relations" are given top consideration. In addition, two (2) concrete strategic priorities are highlighted. These are: "improvement on crime prevention and control" and "improving community safety awareness through community-oriented and human rights-based policing". There is due stress to the importance of reaching out to the communities the PNP serves and of obtaining their support, cooperation, and eventually their higher level of trust and confidence in their police force which also underscores excellence and integration (close coordination for maximum effectiveness and efficiency) in th conduct of police operations. There is absolutely no doubt how important these strategic priorities under "process excellence" are. Progress in pursuing them effectively and efficiently would strengthen and widen the base of stakeholders' support, and would eventually facilitate the provision of more resources for the organization. Moreover, such progress would also be facilitated by breakthrough results being achieved under the learning and growth perspective. Thus, in the PNP strategy map we see several strategic priorities within each perspective being very closely tied-up and linked with each other. Moreover, several of those strategic priorities within one perspective are also closely connected with the others. Finally, we also see that the different perspectives themselves show close and deep interdependence with each other. 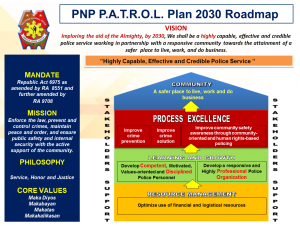 Moreover, the PNP strategy map makes clear that this is to be done mainly through improving further the positive performance of the PNP, and undertaking a sustained public information program utilizing its Communications Plan (COMPLAN) with a view towards strengthening the partnership and cooperation it should be forging with the communities it serves. Ultimately, the community is best served by capable PNP personnel that effectively uphold the rule of law resulting in a safer place to live, work and do business. 16. What is the rationale behind choosing the four (4) strategic perspectives of the PNP Strategy Map? The PNP has chosen to highlight four (4) Perspectives considered to bring about the principal outcome in the process of realizing its vision by 2030. Within each of these 4 perspectives are the strategic priorities the PNP seeks to give a lot of importance to, as it go about the strategic tasks related to becoming, "a highly capable, effective and credible police service", "Stakeholder's Support" is highlighted as an important intervening factor in all of the four perspectives. 17. What is the role of the stakeholders in the PATROL PLAN 2030? The stakeholders play a very important role in the successful implementation of the PNP PATROL Plan 2030. Their partnership and cooperation with the PNP through public information and dialogue will provide the necessary feedback on the performance of the PNP and at the same time they can provide support to help the PNP in moving forward toward its vision by 2030. 18. What are the benefits to the PNP organization using a scorecard system? 19. What is the rationale of choosing the 11 strategic initiatives? The rationale in prioritizing the eleven (11) strategic initiatives is due to funding gap. The TWG deemed these 11 initiatives to bring better results and greater impact on the performance of the PNP as an organization.